I recently discovered a Facebook group for Scrapbookers that is dedicated to Scrapbook/Craft Organization. I was doing a quick facebook group search to see if I could find other male/father scrapbookers and I stumbled across this gem. 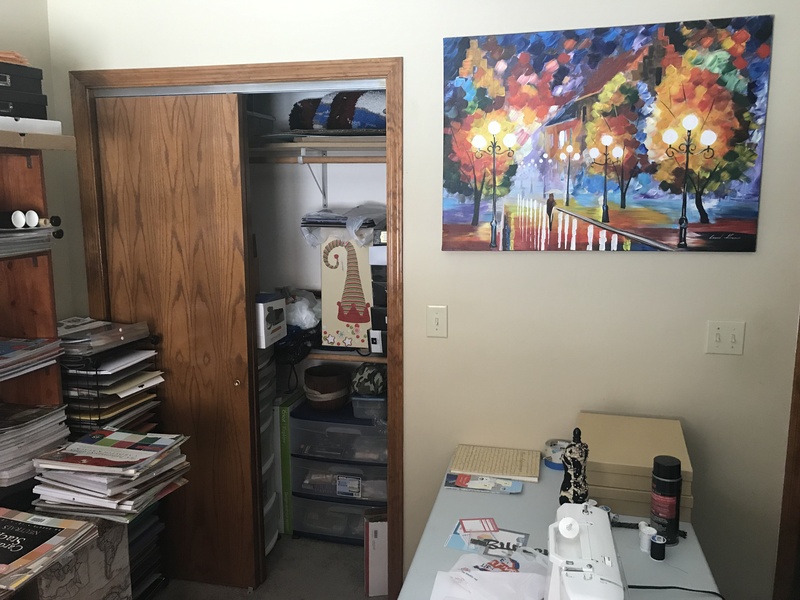 After spending just a few minutes looking at others ideas I was inspired to try some of their ideas – as well as to write this blog about my craft room. Two quick notes about this picture. The folding table also serves as a sewing table and can be put away to make room for an inflatable mattress for when guests come to stay. I wish I had a Murphy bed built into the wall! I work at the table in front of the window, so that if I get opportunity to work during the day time I can work in natural light. I always keep the blinds closed when I am not working so that craft items don’t fade in the sunlight. 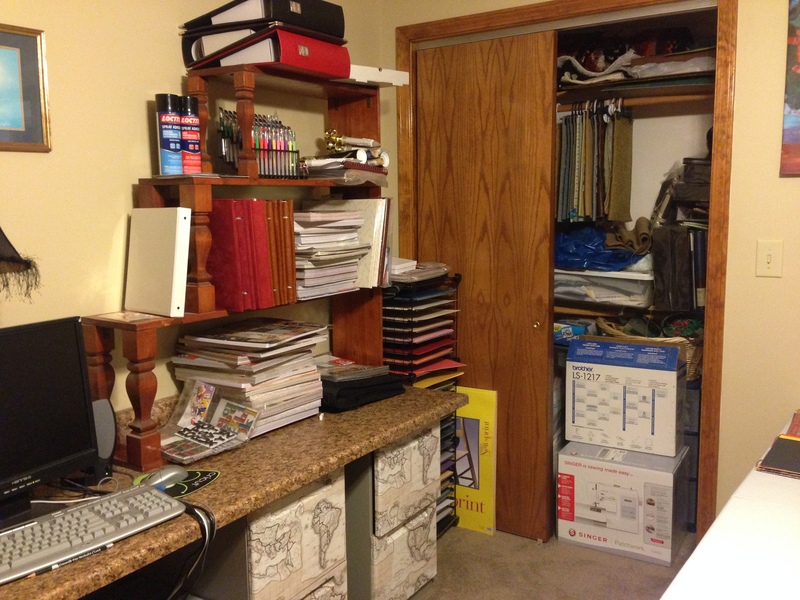 This second picture shows the right hand side of the room where you can see my catch all closet and the shelves that I use to keep my paper stacks. I built this shelving unit when I was still in college so that it could hold my fish tank and my text books in my dorm room. I am glad that I have been able to re-purpose it here in the craft room. If you look carefully on the top shelf you will see what looks like a pizza box – it is! I was able to get some unused ones which store 12×12 projects amazingly. When I go on vacations I always take one with me to bring back ephemera as it protects them in the suitcase on the plane. 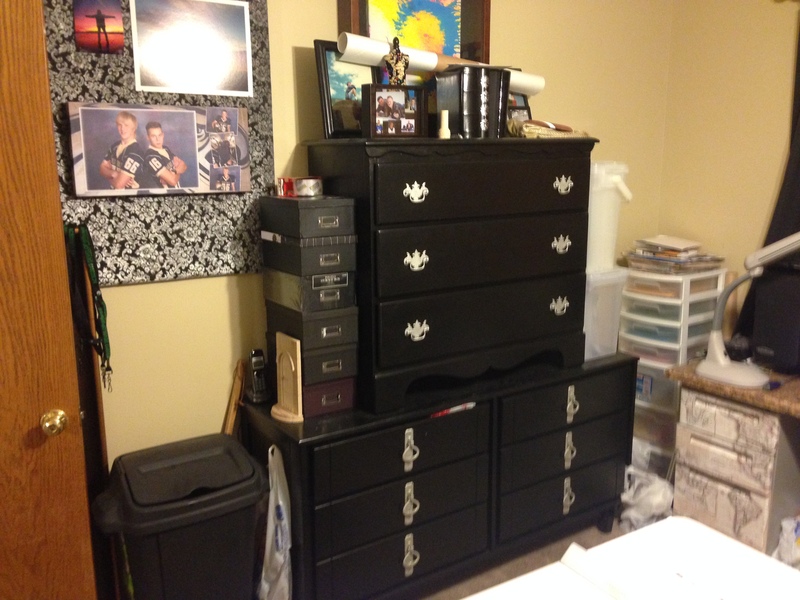 The third picture shows the left hand side of the room, and what I want to feature here is the large black drawers. These are actually two dressers stacked on top of each other. I rescued one from the dumpster and the other one I bought from Craigslist for $10. I removed the hardware, which I spray painted silver, and then painted all of the drawers and cabinets black. I actually painted them right in this room. I placed plastic on the ground and painted them in place. These drawers hold Christmas wrapping supplies, yarn, frames, and other miscellaneous things that I only need to access from time to time. This next picture highlights how I made my large workspace desk. My workplace was getting rid of the file cabinets for $5 a piece and I knew that I could use them. They were part of work stations and so they did not have a top when I purchased them. I was able to find two pieces of kitchen counter top at Lowe’s in the Clearance/Return section for about $78 if I remember correctly and they fit the room perfectly. I do remember that it was almost impossible to get the longer one up the stairs – but we made it happen. The cabinets were scuffed and grey so I went to a local wall paper store (thank Pinterest for the idea), and purchased this map wall paper for $1 per roll. I bought five rolls not knowing how much I would need – and basically only used 2 rolls for all six cabinets. I used modge podge to glue them to the drawers, and an exacto knife to cut the paper around the handle areas after they had been glued on to the drawers. It was much easier than I thought it would be. 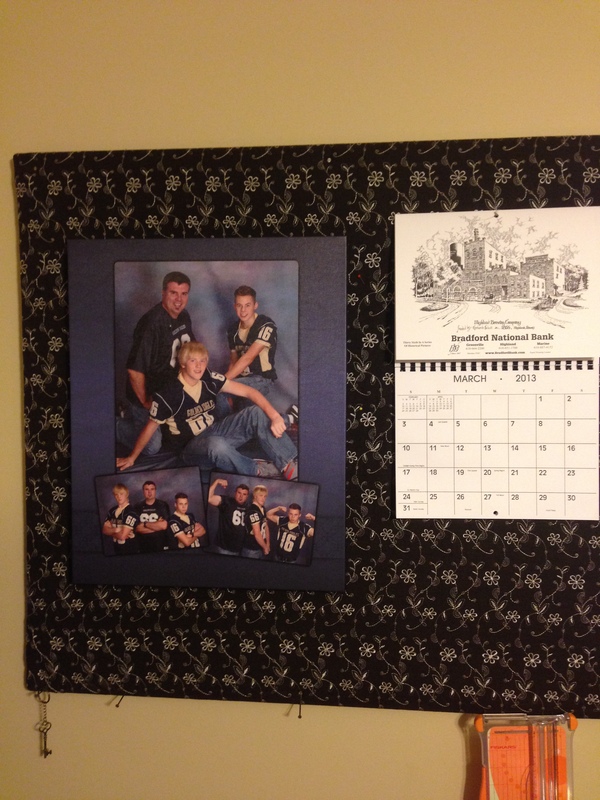 This last picture showcases something that I am pretty proud of – the bulletin boards on the walls in my craft room. The walls in my craft room had been bare for a while and I wanted to add some pictures to the space, as well as something that I could pin things to while I was working on projects. I had been shopping around for cork boards – which are very expensive by the way, when I came across a dumpster at my work which had a bunch of office cubicles that were being thrown away. I realized that the cork pin walls that separate the cubicles would make excellent pin boards. I was still in my suit for work and it was starting to rain, but I climbed up into the dumpster and started pulling these out. I was able to find 4 good ones that had not been damaged and brought them home. At home I took fabric that had been purchased from the remnant section and wrapped the board and then pinned it to the back. To mount these to the wall I simply took 4 inch nails and pounded them into the wall in the four corners of the board. I know it will be a mess when I take them down – but I hate the color of this room anyway so if they ever come down it will be for painting and will not be a big deal to patch the nail holes. This is final picture of my craft room. It shows the view from the window looking towards the closet. I included this picture as I wanted to show my Afremov picture that is on the wall. Afremov is one of my favorite artists and I love the colors and light that he uses. I find it inspiring in my craft room. Well – That’s my scrapbooking room – I hope that you enjoyed it. Love your craft room 🙂 And those dressers look stunning! I love your craft room and the way that you have gone “dumpster diving” to furnish it. I do not know if you have a Habitat for Humanity ReStore in your area, but I have found a number of great deals on things in my local store. In particular, “Real” office chairs that companies paid $400 or more to purchase originally and I bought them used and still in good shape for $10. I also found a couple of desks that had been taken out of motel rooms. These desks did not have any drawers and were basically just a flat surface with sides. 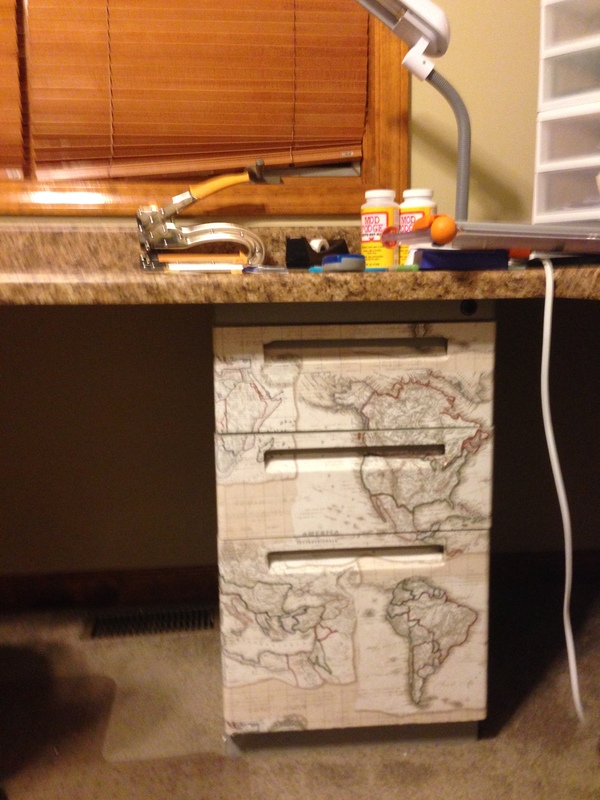 I then purchased a countertop from the clearance section and placed it on top of the 2 desks. 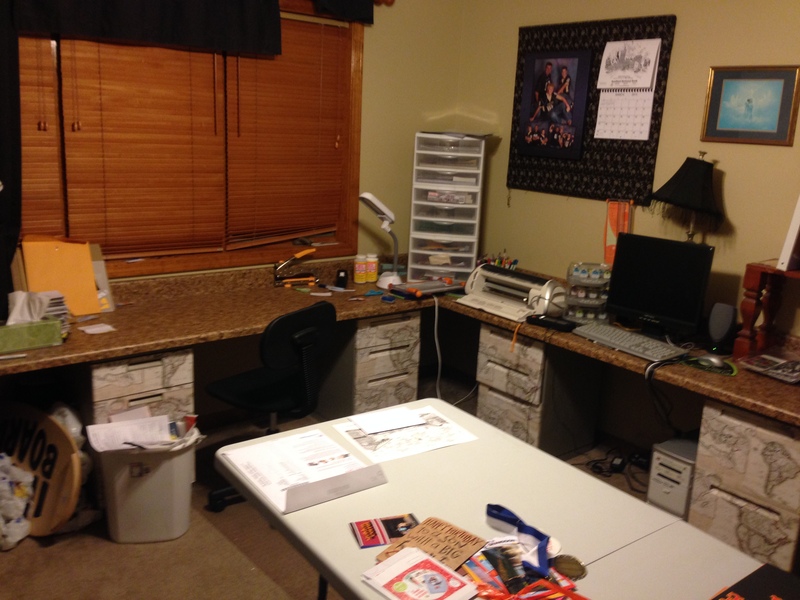 It is an awesome workspace for my serger and free arm sewing machines. So when I say I love your “dumpster diving” craft room I mean it.